Inspiration without action is merely entertainment. This is a quote from my friend and mentor Mary Morrissey, and it is very apropos at the start of the New Year. Has this scenario ever applied to you? 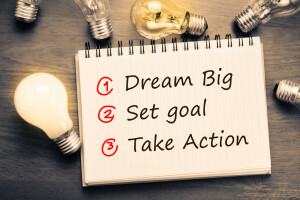 You were inspired to create a plan of action for the New Year yet shortly after it started, you began having a hard time finding the passion to keep the momentum going and to keep your plan of action alive. If so, it’s time to take action and recapture that motivational fire! Here are my five steps to get moving in 2016. Make a list of new actions that will move you towards your goals. These can be quarterly, monthly, weekly... even daily! Plan time to meet with your co-leaders and top producers. Align your visions, strategies, and expectations for 2016. Ensure you have a system of accountability for these new actions. A chain is only as strong as its weakest link! Follow up on progress. Keep yourself and your team honest by checking in on a regular basis. Most importantly, stick with it! Staying the course, even when the going gets tough, will produce data and results that will be invaluable at the end of the year! Taking the time to create an action plan and implement new ways of doing things will increase your results and drive your team towards new heights this year.